Find the right tour for you through Abu Simbel. 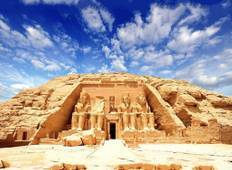 We've got 163 tours going to Abu Simbel, starting from just 3 days in length, and the longest tour is 142 days. The most popular month to go is October, which has the most number of tour departures. "An incredible combination of must see tourist spots like the pyramids/sphinx/Abu..."
"We were very happy with how we were treated for our tour. Our Itinerary was just..."
"I'm from Dubai and in one of the holiday,we did trip with lama Egypt tours,and we..."
"Albert was outstanding as a guide. Extremely knowledgeable and personable. I felt..."
"It was a fantastic trip. 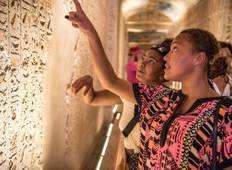 Who would not enjoy seeing the pyramids and tombs and temples..."
"I haven't stopped raving about this trip since it started. Everything was so organised..."
"Everything was great. Amazing experience!" "For a men getting no younger who have wanted to see then Pyramids and The Valley..."
"Having planned an eight day trip to Egypt we searched for a tour which was competively..."
"I felt so safe in Egypt and loved every moment. The cruise ship was luxurious with..."
"had a fantastic holiday and the guides were very knowledgeable....would definitely..."
"Overall we had a very enjoyable tour with Lama Tours. We have always wanted to explore..."
"The guide was excellent, the tour beyond my wildest imaginings. Wonderful, insightful,..."